Tonight, the Vegas Golden Knights host the young, up-and-coming Arizona Coyotes in a Pacific Division battle. For a game between teams with two very different situations, there are a decent amount of intriguing storylines to follow in tonight's tilt. #1 - Both teams have been struggling lately. Vegas' struggles have been well documented around town these past few weeks. Heading into the all-star break, the Golden Knights dropped two in a row against Minnesota and Nashville. They dropped the first two upon their return to much lesser teams in Carolina and Florida. After two wins against the Lightning and Red Wings, Vegas lost their third straight home game, at the hands of Cam Atkinson and the Blue Jackets. Will Vegas be able to snap their home losing streak or will the wheels continue to spin for the Golden Knights? Arizona has lost five of their last six, most of them being one-goal games. Four of the six games were separated by one goal, including a win in their last game over the Dallas Stars. The Coyotes will be ready for Vegas, coming off of games against four solid playoff teams in the Stars, Sharks, Predators, and Blue Jackets. Both teams will be hungry for two points, in a game thay could possibly end up having playoff implications down the line. #2 - Injuries have been a problem for both clubs. Currently, Vegas is as healthy as they have been all season. The Golden Knights recently got William Carrier, Reilly Smith, Colin Miller, and Malcolm Subban back from the IR. Vegas remains without forwards Erik Haula (Lower Body, Long-Term), Ryan Carpenter (head), and defenseman Nick Holden (lower body). Carpenter has missed the last two games, following a hard hit from Cedric Paquette of the Tampa Bay Lightning. Despite those three injuries, Vegas is relatively healthy, having lost Cody Eakin, Paul Stastny, Alex Tuch, Max Pacioretty, Carrier, Smith, and Subban all to injury at some point in the first half of the season. Arizona's injured reserve is a list of key players they are forced to play without. Most notably, the Coyotes have been without starting goaltender Antti Raanta since late November due to a lower body injury. Darcy Kuemper has filled in admirably in Raanta's absence (2.75 GAA, .911 SV%) and original Golden Knight, Cal Pickard was brought in to serve as back-up, for his third team this season (Toronto/Philadelphia). Also out for the Yotes are Nick Schmaltz (LBI), Mario Kempe (UBI), and penalty kill specialist Michael Grabner (eye). #3 - Both teams are fueled by young cores, featuring promising young superstars. Alex Tuch is a superstar in development. His uncanny mix of size and skill make him hard to play against and a unique player to have. George McPhee, General Manager of the Golden Knights realized the 22-year old's potential and locked him up for seven more seasons at a cap hit of less than $5 million/year. Vegas' lineup is rounded out with nine players at or younger than 26 years-old, prime age for NHLers. In the visiting locker room will be Clayton Keller, who has all the potential in the world. 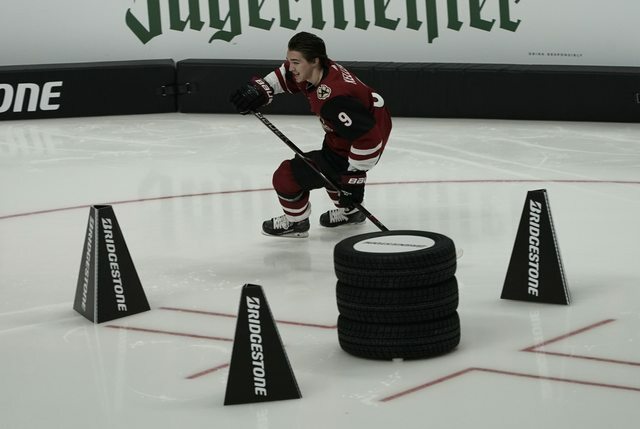 As the Coyotes' all-star representative this season, Keller showed off his speed in the fastest skater contest during the annual NHL Skills Competition. A 2016 1st round draft pick, Keller is just 20-years old and plays big minutes for the Coyotes. Rounding out Arizona's young core are Alex Galchenyuk (24), Conor Garland (22), and Christian Fisher (21) who all have recorded double digit goals this season. #4 - Both teams spread out the scoring. Vegas currently has five players with at least 10 goals this season, led by Jonathan Marchessault (19 goals). 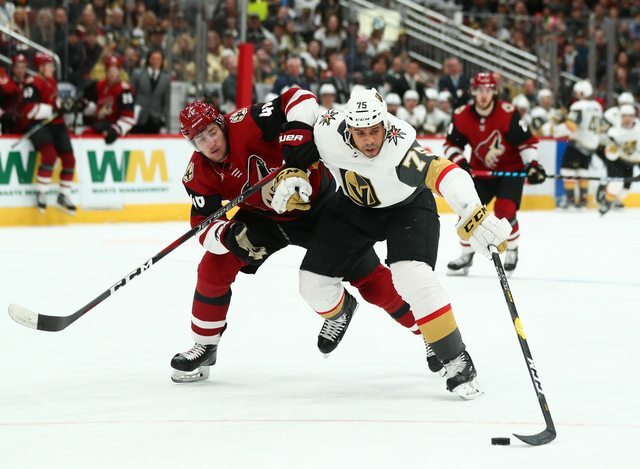 Five other players have at least eight goals for the Golden Knights, including "enforcer" Ryan Reaves. Although their third line struggles to find the right combo, Vegas counts on their bottom six for added production, a majority coming from center Cody Eakin. Arizona has a whopping seven players with at least 10 goals this season. None of those players have topped 11 which explains their current, middling position (24-26-5, 53 points, 5th Pacific). Personally, I expected the Coyotes to take a big step forward this season and contend for a playoff spot, led by captain Oliver Ekman-Larsson. While they have a talented team with tons of upside, it just hasn't happened yet. Although they play lights out in flashes, the Yotes have yet to truly fulfill their potential. #5 - Both PKs are solid, will either mediocre power play unit make the difference? Vegas' power play woes have been very evident in calendar 2019. Since the ball dropped in NYC, the Golden Knights are a putrid 5/43 (11.6%) with a man advantage. They had success utilizing Reaves as a netfront presence on the second unit, but have gone away from it. This is not to say Reaves is the savior to their power play, but he was producing and it couldn't hurt to go back to it. On the season, overall the Golden Knights sit at 20th with a 18.13% success rate on the PP. When down a man, Vegas has been solid, sporting a 83.44% kill rate, good for fifth in the NHL. Not far behind Vegas is the Coyotes' "power" play at 21st in the league (17.51%). With so much young, dynamic talent and solid offensive-minded defensemen, the Coyotes should be much better on the man advantage. Offsetting their PP shortcomings is the top PK unit in the league, operating at 85.09% on the season. On top of shutting opposing power plays down, the Coyotes' unit is second in the NHL in shorthanded goals with 12 shorties. Grabner accounted for four of those, utilizing his mind-blowing speed, but in his absence Derek Stepan, Brad Richardson, Lawson Crouse, and Richard Panik carry the load while down a man. Honestly, tonight's game could go either way and is pretty hard to forecast. Both teams prefer to play with pace and don't shy away from the physical side of the game. Expect William Carrier (Vegas) and Nick Cousins (Arizona) to mix it up with their chippiness and unrelenting forechecking style. Tonight's contest may very well come down to the goaltending. Vegas has "old" faithful Marc-Andre Fleury on their side and they know what they're getting from him on most nights. Arizona may need a big night from Darcy Kuemper in order to leave Vegas with two points. 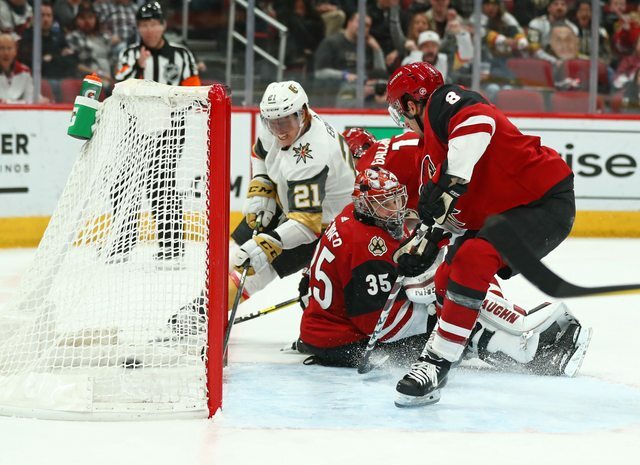 Vegas won both meetings earlier this season, following a 3-2 overtime thriller with a 5-1 shellacking, both in Arizona. Will the Coyotes be able come into Vegas tonight and return the favor? Puck drop is scheduled for 7pm this evening. Be sure to follow me on Twitter (@VGK_Buzz) for in-game updates, daily VGK news, and analysis.